Notice: Park Restrooms are now open during regular park hours! Thank you for your patience as we made repairs. From Highway 101 take the Candlestick Park exit heading towards the stadium and follow the shoreline to the Candlestick Point State Recreation Area (Day Use) parking lot. The Campground at Candlestick Point SRA (hike, bike, and boat access only) will be available ONLY by reservations starting October 1, 2018. Fees for camping are $35 per night. Please click the reservation link for availability, or call 1-800-444-7275 (PARK). 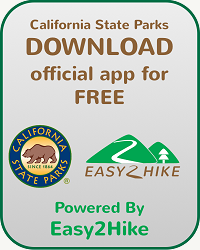 The campground is accessible via the San Francisco Bay Trail (hike/bike) and the San Francisco Bay Water Trail (boat). Due to its limited features, the campground is designated a Primitive Campground facility. Click here for more information. 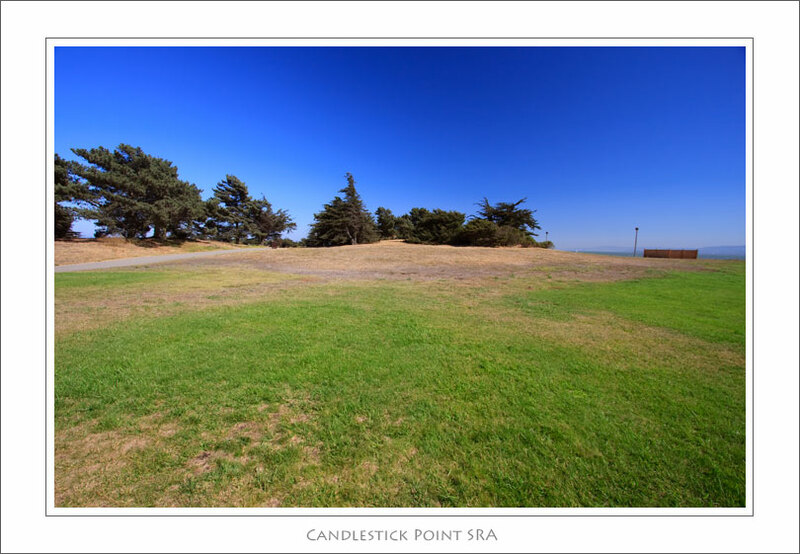 From Candlestick Point State Recreation, visitors can enjoy panoramic views of the San Francisco Bay, the East Bay Hills,San Bruno Mountain as well as relax in the peaceful scenery of the park itself. 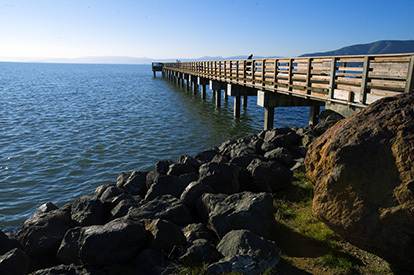 Its location on the western shoreline of the San Francisco Bay provides a variety of recreational opportunities from windsurfing, fishing, bird watching and walking to simply relaxing. The trails, group picnic sites and fishing piers at this urban park offer a get-away of open space and outdoor activities. 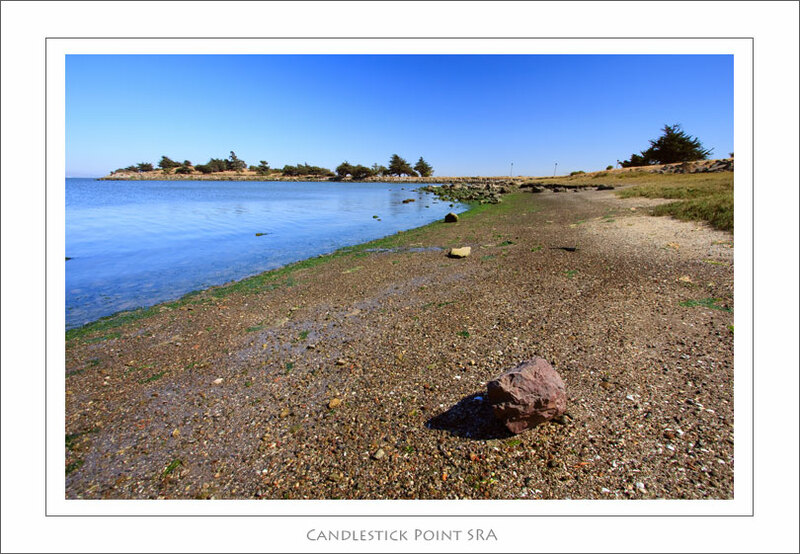 Candlestick Point SRA was the first California State Park unit developed to bring state park values into the urban setting. From historic wetlands to landfill to landscaped park, Candlestick Point demonstrates major land use changes of the San Francisco Bay. Its name is derived from 19th century locals who thought the burning of nearby abandoned sailing ships and their flaming masts in the bay resembled lighted candlesticks. 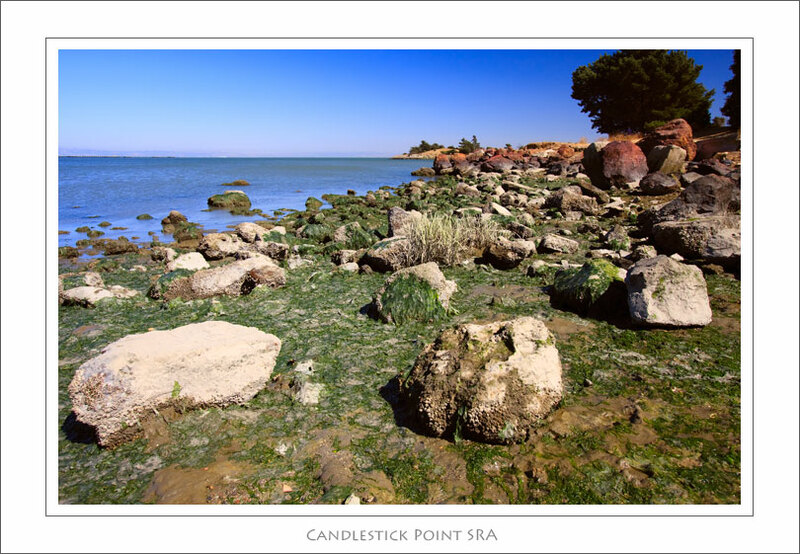 Candlestick Point SRA is a unique state park on San Francisco Bay offering a variety of recreational opportunities for visitors. Wind sheltered individual and group picnic areas have spectacular bay views. There is a 50 person limit per group site; all groups sites are walk-in only. No reservations or fees required at this time. All sites are first come first served. Please note some activities require special use permits and additional fees in order to avoid fines. Prohibited activities include: Bounce Houses, Private vendors, DJ's, Amplified music, Drones, or sales of any kind. Commercial filming requires a permit from the California Film Commission, and need at least 10 days to process. Windsurfers enjoy the wind-whipped bay along Candlestick’s shores, primarily in the spring and summer. The park is popular for the fishing opportunities found along its shoreline and a public pier. The "Old Pier" on Jamestown Avenue is temporarily closed for rehabilitaion. The "Fishing Pier" at Sunrise Point remains open for use. Depending on the season, catches might include halibut, striped bass, perch or sturgeon. No fishing liscence is required on the pier, but there is two pole limit per person, or 1 pole and 1 net. Fishing from the shoreline requires a permit and is limited to one pole only. Bird watching is best in the winter when migrant waterfowl and shorebirds are numerous in the bay, but pelicans, egrets and hawks can also be seen throughout the year. Please remember all wildlife and plantlife is protected within the park. A fitness course along Candlestick’s popular shoreline walking trails is an asset to those who wish to stay in shape. Please note that there are no LifeGuards on duty at any time. It was first born during World War II as 170 acres of landfill that was going to be used as a U.S. Navy shipyard. After the war, the landfill remained, but without a purpose. Some of its neighbors found a purpose for it--an easy place to dump their garbage. Other neighbors sought a different purpose; they wanted to turn it into a park, with grass, trees, shrubs, and flowers. In 1973, the state legislature set aside $10 million to purchase the land. In 1977, the California Legislature voted to develop the land as a state recreation area--the first urban state recreation area. The park offers hiking, jogging, bicycling, bird watching, informal games, and picnicking. There is a bike path and a fitness course. Candlestick Point is also a popular entry point for windsurfing on the bay. On any given day, people come to exercise, fish, and just enjoy the experience of "getting away from it all" - a treasured respite from city life. It is also valued as a community park with many frequent visitors from the nearby Bayview/Hunters Point neighorhoods. Firearms, weapons or hunting is not allowed. Possession of loaded firearms and air rifles is prohibited. This includes anything that shoots a projectile, including, but not limited to, arrows, pellets, BB's, paint balls and sling shots. Please note some activities require special use permits and additional fees in order to avoid fines. Please contact the park office to plan your event early. Prohibited activities include: Bounce Houses, Private vendors, DJ's, Amplified music, Open ground fires, Drones, or sales of any kind. Commercial filming requires a permit from the California Film Commission, and need at least 10 days to process. Camping is by reservation only, and tents are allowed only in Sunrise Point campsites. During fire season - the California Fire Marshall may require us to post a Red Flag Warning when conditions are exceptionally dry. During this warning - all fires are prohibited within the park. Fire works, and Candle Lanterns are prohibited at all times.